A farmer dries coffee (file photo). From February 13-15,2019, Rwanda will host the African Fine Coffees Conference and Exhibition, an annual event hosted in rotation in Africa's coffee producing countries. The meeting will discuss solutions to the challenges facing the industry and explore the opportunities for the continent's coffees. This comes after a good year for Rwanda's coffee industry. For instance, last year coffee produced by Ngororero Coffee Washing Station in Western Province scooped two international awards; "Best of the Best" and "Coffee Lover's Choice" in a competition that attracted brands from nine countries around the world. In addition, Rwandan coffee started trading on the world's largest ecommerce platform, Alibaba, thanks to the Electronic World Trade Platform deal between the company and the Rwandan government. Ahead of the conference, The New Times' Hudson Kuteesa interviewed Dr Celestin Gatarayiha, the Head of Coffee Production and Processing Division at National Agricultural Export Development Board. African Fine Coffees Association is an association of coffee producing countries in Africa. It started in 2000. That time it was called the East African Fine Coffees Association because it was only for East African countries. They later changed to cover the whole of Africa. Every year it brings together people from coffee producing countries in Africa, as well as those from outside of the continent who buy or play other roles in the coffee industry. The conference will attract up to 2000 participants. We last hosted it in 2009. It will help us to promote our coffee. Our producers will meet with buyers. It is an opportunity to have it here, because when it is held outside Rwanda, it is very expensive for our producers to go there. But now, many farmers, cooperatives, exporters will be able to meet with buyers for the promotion of their coffee as well as marketing. After 10 years, you are hosting this meeting again. What achievement did you register between when you last hosted it and now? First is the quality. We have improved the quality of our coffee from low to where we are now. In 2002, we didn't have specialty coffee. But every year it has been increasing, until 2017 where we reached 58 per cent of our total production being specialty coffee. This is a great thing, and we target by 2024 to have at least 80 per cent of our coffee being fully washed coffee (from which specialty coffee comes). Fully washed coffee means the coffee that passes through the coffee washing stations at factories, as opposed to that dried by farmers at home (called semi washed coffee). The conference also seeks to increase coffee consumption locally. What's the current outlook for the domestic coffee market? When we have such a conference, the main purpose is to promote coffee and increase exports. At the same time, because our coffee is good, we should also enjoy it. But local consumption is low. This is not a big challenge though, because we still need to export. Currently, 97 per cent of our coffee is being exported while the rest is consumed locally. Yet, still if people consume coffee locally it is good because it means that we are going to limit imports of these foreign coffees, which contributes to improving the trade balance. How much coffee do we export to other African countries? Last year, we exported 8 per cent of our coffee to Uganda, 2 per cent to Kenya and 1 per cent to South Africa. We exported 24 per cent to the US, 37 per cent to Switzerland, 10 per cent to the UK, 9 per cent to Singapore, 5 per cent to Belgium, 1 per cent to Australia, 1 per cent to Japan, and 1 per cent to Malta. How did the industry perform last year and what are the projections for this year? Last year we exported 24,000 metric tonnes, and it fetched about $67 million. This year we target to fetch about $75 million from coffee exports. How competitive is our coffee compared to other African countries? In Africa, the biggest coffee producing country is Ethiopia, followed by Uganda, Tanzania and then Rwanda. But these are rankings for volume. On quality, we are very good. We compete very highly. Volume wise it is hard to compete with them, but quality wise, we compete. How does this conference benefit a smallholder coffee farmer? Coffee belongs to the farmers. If a farmer doesn't get the motivation to produce more, even the exporter can't get coffee. The heart of the value chain is the farmer. 60 per cent of the money from our coffees that win cups of excellence goes back to the farmer. If we promote coffee and it is bought well, the exporters will be able to buy from the farmers at good prices. We have also come up with traceability measures. 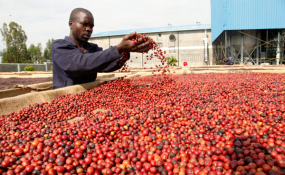 We are able to know the different farmers that contribute to a particular factory so that when coffee is sold at higher prices at the international market, the factory can give them bonuses. What are the prices for Rwandan coffee on the international market? At the international market, our semi washed coffee is sold under the normal price. It has a differential of 10 cents per pound, which is like $0.2 per kilogramme. Fully washed coffee, however, is sold at a higher price with an addition of 20 cents per pound ($0.5). Our fully washed coffee is sold at a price that is higher than that of Brazil or Colombia. Semi washed coffee is not doing well. These prices are institutional, but the exporters can negotiate with buyers and get more.